Peter Zimmermann, Agent. © Peter Zimmermann. Dirimart Nişantaşı is pleased to announce Peter Zimmermann’s fourth solo exhibition at the gallery. may be may takes the ambiguity of concepts that people have created over time as a point of reference.Through bringing together different compositions from different series and from various points in his practice since 2000, the artist proposes a new perspective for his work. He also makes an intervention in the space through which the exhibition becomes a work in and of itself. The emerging of new technologies through digitalization has brought about many changes in the possibilities of artistic production. This development is not only reflected in the emergence of Internet art, or through the media of photography, film, and video, but it also influences the art of painting. Peter Zimmerman is inspired by this digital development and methods of distribution. He has archived images from the Internet or from magazines, books, and catalogues since 90s, categorizing and organizing them under the rubrics of architecture, cover, sculpture, typography, geometry, ornamentation, TV, etc. This grouping presents the artist’s interest areas while giving clues about the deepest, invisible layers of abstract compositions. 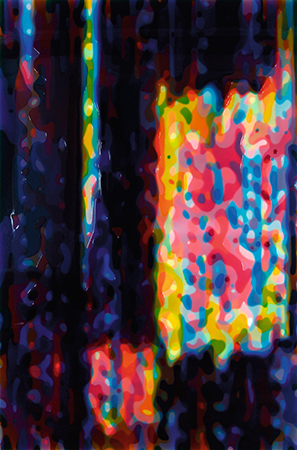 While Zimmerman had used a lot of digital materials earlier in his practice, he takes his works out of the parameters of both new media art and abstract art. The images that have been digitally manipulated are thus transformed into visual art, proposing an opposition to the “trash of images” that we are surrounded by. The images are placed in specific contexts to be transformed into epoxy paintings on canvas, thus instrumentalized. Coincidences play a major role in the process of abstraction. The artist liberated his own traditional compositions and gives possibility to what is beyond expectations and beyond what can be foreseen. Epoxy, combined with different color pigments, rarely achieves the intended result and the manual labor of the production process strengthens the ambiguity of the outcome. Peter Zimmermann (b.1956, Freiburg) studied in State Academy of Fine arts in Stuttgart. He has had solo exhibitions at Baden-Württemberg (2017), Museum für neue Kunst, Freiburg (2016), and Museum Moderner Kunst Klagenfurt (2009). His works are included in the collections of Centre Pompidou (Paris, France), Museum of Modern Art (New York, the USA), Staatsgalerie Stuttgart (Stuttgart, Germany), and Museum Moderner Kunst (Frankfurt/Main, Germany). Zimmerman works and lives in Cologne.